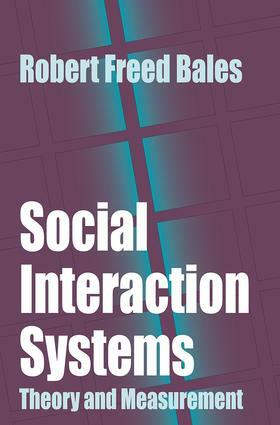 Social Interaction Systems is the culmination of a half century of work in the field of social psychology by Robert Freed Bales, a pioneer at the Department of Social Relations at Harvard University. Led by Talcott Parsons, Gordon W. Allport, Henry A. Murray, and Clyde M. Kluckhohn, the Harvard Project was intended to establish an integrative framework for social psychology, one based on the interaction process, augmented by value content analysis. Bales sees this approach as a personal involvement that goes far beyond the classical experimental approach to the study of groups.Bales developed SYMLOG, which stands for systematic multiple level observation of groups. The SYMLOG Consulting Group approach was worldwide as well as interactive. It created a data bank that made possible a search for general laws of human interaction far beyond anything thus far known. In his daringsearch for universal features, Bales redefines the fundamental boundaries of the field, and in so doing establishes criteria for the behavior and values of leaders and followers. Bales offers a new "field theory," an appreciation of the multiple contexts in which people live.Bales does not aim to eradicate differences, but to understand them. In this sense, the values inherent in any interaction situation permit the psychologist to appreciate the sources of polarization as they actually exist: between conservative and liberal, individualistic and authoritarian, libertarian and communitarian. Bales repeatedly emphasizes that the mental processes of individuals and their social interactions take place in systematic contexts which can be measured. Hence they permit explanation and prediction of behavior in a more exact way than in past traditions. Bales has offered a pioneering work that has the potential to move us into a new theoretical epoch no less than a new century. His work holds out the promise of synthesis and support for psychologists, sociologists, and all who work with groups and organizations of all kinds. Can There Be an Optimum Value Profile?